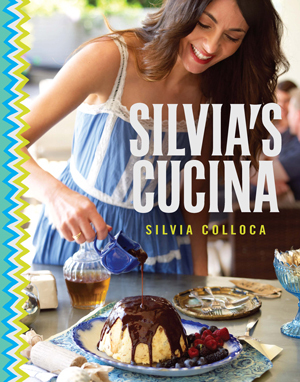 Italian food lover, blogger and actress Silvia Colloca shares her flourless chocolate hazelnut truffle cake recipe from her new cookbook Silvia’s Cucina. I feel beholden to this simple ﬂourless cake. The moment I posted the recipe on the blog, back in June 2011, I knew something in my short-lived blogger life had changed. Comments started trickling in, and that trickle soon became a torrent! It seems that this traditional cake from Piemonte speaks a language that everybody is ﬂuent in: chocolate. But to call this a chocolate cake doesn’t really do it justice. What makes this indulgent cake so alluring is the addition of Frangelico and coffee-spiked cocoa paste. This blissful blend somehow ‘chociﬁes’ the chocolate: it is chocolate to the power of 10. So if you love a gentle, sweet, milk-chocolate cake, torta gianduja is not for you. But if you are a true believer, a proud chocolate addict, read on . . .
2. Melt the butter, chocolate and salt in a heatproof bowl set over a saucepan of barely simmering water, stirring occasionally (make sure the bottom of the bowl doesn’t touch the water). When melted, remove from the heat. 3. Whisk together the hot coffee and cocoa powder in a bowl until there are no lumps. Stir in the vanilla and Frangelico or rum, then add to the melted chocolate and mix to combine. 4. Crack the eggs into a bowl, add the brown sugar and beat with a whisk or hand-held electric beaters until creamy. Pour into the chocolate mixture, then stir in the hazelnut meal and chopped hazelnuts. 5. Pour the batter into the tin. Bake for 45–55 minutes or until the edges are firm and the surface is cracked but feels soft in the middle. Remove from the oven and cool in the tin for 1 hour, then gently turn out the cake and sit it on a cake stand. 6. Dust with cocoa powder and serve with whipped cream and your favourite berries. This cake tastes even better the next day. If making a day ahead , store it in its tin at room temperature, and garnish with cocoa powder, berries and cream just before serving. This recipe for sugar, dairy and gluten-free chocolate cake is packed with superfoods and is a piece of cake to make (pun intended!). 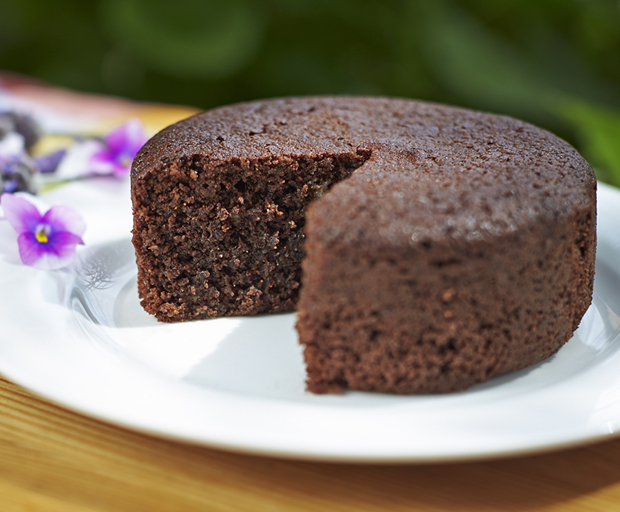 This healthy chocolate cake recipe is an adaption from a Nigella recipe, but changed to suit the parameters of my diet: soy, dairy, sugar and gluten free – and organic where possible. It also has a low glycemic index. My favourite thing about this recipe is the amount of good things in it; particularly the coconut oil, cocoa powder and almond meal. Pure, virgin coconut oil is nature’s best source of lauric acid, high in vitamins K and E which is great for your heart and cholesterol, fights bugs to keep you healthy, and has amazing properties for your skin and hair. Cocao powder is super high in antioxidants (flavonoids), has phenethylamine which works as a mood elevator and has the ability to reduce the risk of blood clots, boost cognitive performance and lower high blood pressure. Almond meal is packed with protein, antioxidants, monounsaturated fats (the good ones), and vitamin E, magnesium and potassium and is great for digestion. This makes a small cake, so double the quantities if you’re using a regular cake pan. 1. Preheat oven to 170°C, oil and paper a small (11cm) cake tin. 2. Sift cocoa and whisk with boiling water, add vanilla extract and leave to the side to cool (not in the fridge, if the mixture is too cold it will affect the coconut oil later). 3. Combine almond meal, salt and baking power in a small bowl. 4. In a separate bowl, combine sugar, oil and egg, and beat with an electric mixer. Make sure the coconut oil is liquid. Whisk until creamy. With the beater on a low setting, slowly add the cocoa mix and almond mix. If too runny, add a dash of desiccated coconut. 5. Pour into the cake tin and bang the tin on the tabletop to even out the mixture. Bake for about 25 minutes (or an hour for a larger cake). I find the best way to check if the cake is ready is to see if the sides of the cake have come away from the tin slightly, and to skewer the centre, it should still be slightly moist. Just try not to open to oven unless you have to – it makes the centre of the cake sink. 6. Remove from oven, leave to cool in the cake tin for 10 minutes, and then remove from tin and leave to cool on wire rack. What’s your favourite healthy dessert recipe? Kate Jones blogs about writing and pop culture at Calvicle Capitalism. Looking for the ultimate chocolate cake recipe? Look no further. This recipe gives you a chocolate cake that is the perfect mix of being fudgy without dense, rich but not cloying. You’ll love it! 2. Melt the chocolate in a heatproof bowl set over a pan of simmering water. When the chocolate begins to soften, add the coffee or Kahlua and stir very gently until the chocolate has completely melted. Add the butter and stir until the butter has melted. 3. Meanwhile, beat the egg whites until stiff, then fold in the sugar. Mix the baking powder with the cocoa powder and flour. 4. Remove the chocolate from the heat and quickly stir in the egg yolks, then gently fold the melted chocolate into the egg whites. 5. With a light touch, add the cocoa flour mix to the liquid and stir with a large metal spoon – making sure you don’t knock the air out of the egg white. Don’t overmix, just stir until the flour is combined. 6. Carefully scoop into the lined pan and bake for 35 minutes. Remove and leave to cool in the pan, then serve. The top of the cake will crack a little as it cools, this is normal. 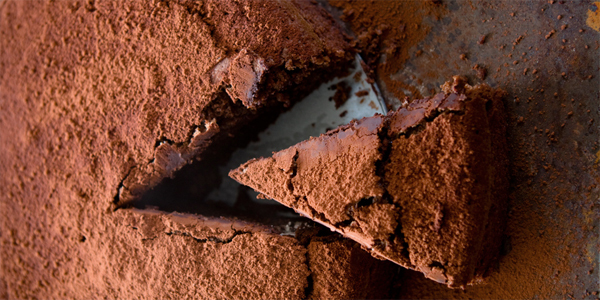 What’s your favourite chocolate cake recipe? How amazing is this Easter cake! Each slice reveals a cute bunny – the kids will love this. 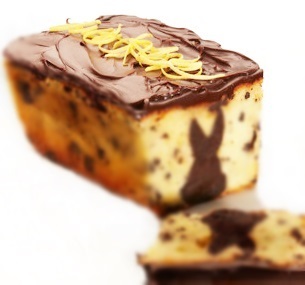 The recipe comes from Lindt Maitre Chocolatier Thomas Schnetzler and we think it’s the perfect Easter project! 1. For the Chocolate Bunny Centre, preheat the oven to 175°C. 2. Combine the butter and dark brown sugar and mix until pale. Add eggs one at the time, mixing well after each addition. 3. Sift together the flour and cocoa and gently mix into the butter mixture. Then add the melted chocolate. 4. Scrape down the sides and stir in the finely chopped chocolate. 5. Spread the mixture onto a tray lined with baking paper. 6. Bake for 15 minutes or until a dry skin forms but the centre remains soft. Set aside to cool slightly and then place in the freezer for 30 minutes. 7. Using an Easter themed cookie cutter of your choice (eg a bunny), cut out shapes and place them on top of each other, forming a Easter themed log. 8. Place in the freezer until lemon cake is ready. Note: Don’t throw away off-cuts as they are perfect for making truffles (recipe here). 1. Cream the butter, sugar, lemon zest and salt until light and pale. 2. Add eggs one at the time, mixing well after each addition. 3. Sift together the flour and the baking powder and mix into the butter mixture. 4. Last, mix the chocolate chunks with little flour which prevents them from sinking and then mix through the cake batter. 1. Grease a 19 cm cake tin and place the chocolate fudge log standing up in the center of the cake tin. 2. Gently place lemon cake batter around the fudge cake being careful not to move the chocolate centre. 3. Bake at 180°C for around 30 minutes or until a skewer comes out clean. 4. Mix together the lemon juice and the icing sugar to create a syrup. Using a skewer pierce some holes and brush the hot cake with the lemon syrup. 6. Top with some chocolate ganache and a little lemon zest. Chocolate? Hot cross buns? What’s your favourite Easter treat? I’ve been craving chocolate cheesecake lately and this no bake recipe is perfect for the warm weekend. Just leave to set in the fridge and you’ve got a creamy, indulgent cheesecake. 1. In a medium mixing bowl, stir together biscuit crumbs, cocoa powder and butter. Press firmly into the bottom of a springform pan. Set aside. 2. In a large mixing bowl, beat cream cheese for 1 minute until smooth. Add icing sugar and beat again. Add vanilla extract and mix again. 3. Melt chocolate over a double boiler or in the microwave. Let cool slightly. With your mixer on slow speed, add the chocolate into the cream cheese mixture, pouring slowly. 4. Whip the cream until stiff peaks form. Fold in gently to chocolate and cheese mixture. 5. Pour the filling over the crust. Refrigerate for at least 8 hours or overnight. When the cheesecake is set, run a sharp knife around the edge to loosen from the pan. Gently open the latch and release the cheesecake. Chocolate? Ricotta? 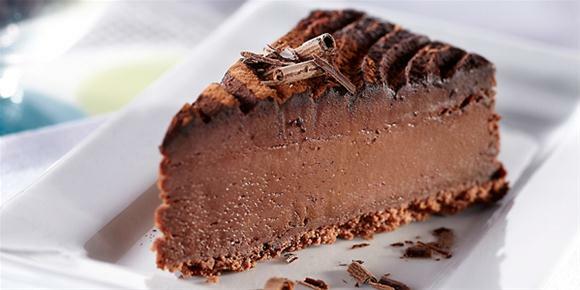 What’s your favourite cheesecake? 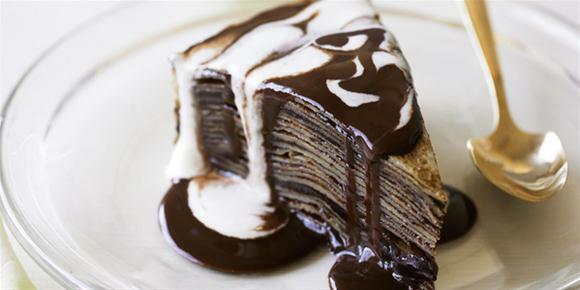 You guessed it, this layered crepe cake tastes just like Nutella! Incredibly, it only takes 30 minute to prepare, and makes a very impressive dessert when entertaining. 1. Place eggs, yolks, flour and milk in a bowl and using a whisk, mix to a smooth batter. 2. Heat a non-stick frying pan, and spray lightly with oil. 3. Pour in some batter and swirl the pan around to evenly and thinly cover the base. Cook until lightly browned before turning, then cook other side until lightly browned and cooked through. Set aside and repeat the process until all of the batter is used. For the chocolate sauce, place cream and sugar into a saucepan and bring to a simmer. 4. Add chocolate, then remove from heat and stir until smooth. Place into a jug and set aside to cool. 5. Place one crêpe onto a cake stand or plate, spread with hazelnut spread and whipped cream. Spread another crêpe with hazelnut spread and whipped cream, then place on top of the first crêpe and repeat this process until the last layer of crêpe. Before serving, pour the chocolate sauce over the crêpes. 6. Serve with fresh strawberries, raspberries or blueberries. Delicious tip:Add 1 tbsp of hazelnut or coffee liquor to the chocolate sauce for that special indulgence. What’s your favourite impressive dessert recipe? Flourless Chocolate Cake flavoured with raspberry liqueur! MasterChef baker Leanne Beck of Sydney’s much-loved Sweet Infinity bakery (Russell Crowe is a fan!) 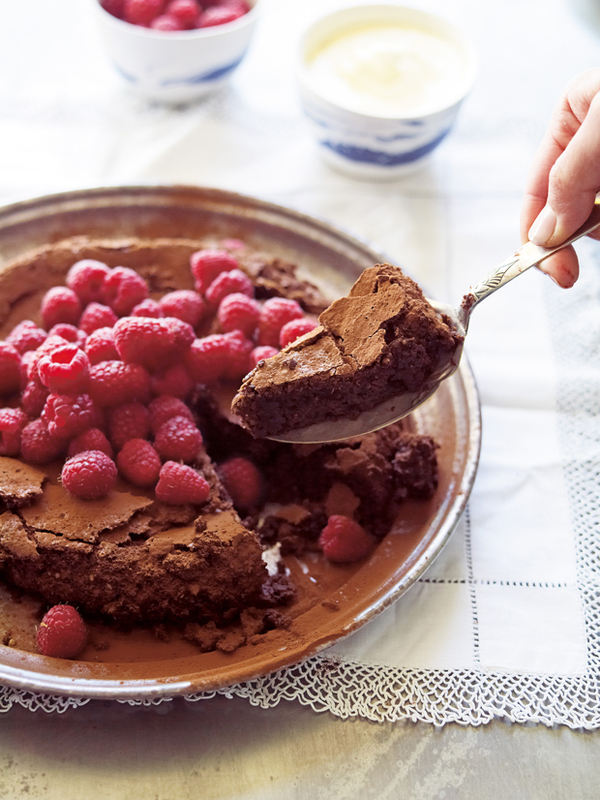 shares her recipe for luscious flourless chocolate cake flavoured with raspberry liqueur! 1. Preheat oven temperature to 180°C. Heat the butter and water in a saucepan until butter is melted. Add chocolate to melted butter mixture and half melt. While there are still lumps of chocolate, over a low flame continually whisk to stop the mixture sticking and burning to the pan. 2. Remove from the heat and continually stir until the chocolate has completely melted. Set aside allowing to cool and add Chambord® to taste. 3. Mix and sieve both flour and sugar together, set aside. Separate the eggs. Whisk egg whites until firm but not dry then whisk egg yolks into chocolate mixture. 4. Add chocolate mixture to remaining egg whites and gently incorporate using your opened hand. Add the sifted dry ingredients and again gently incorporate them using your opened hand. 5. Drop into 22cm cake tin and bake until knife comes out clean, about 25 minutes. Cover with silicon paper if you think the top will burn. Top with raspberries and serve. Have you ever wondered how to create the perfect puff pastry? Or learn how to bake a delicious desert that will have your friends begging for more? Artisan pastry chef Leanne Beck will showcase the skills she has learned from working in some of the most prestigious restaurants in London, Paris and Sydney with her new cooking school in Sydney. From working with chocolate to three course dinners made easy, Leanne’s tutorials range from demonstrations to more hands on classes. Learn from Leanne as she guides you through the skills of an artisan pastry chef and take the opportunity to ask her questions as you go. All classes will be instructed by Sweet Infinity’s Leanne Beck and will include drinks and canapés on arrival, recipe cards, ingredients provided and delicious treats to take home. Some classes will also be provided with an apron to take home. For details on dates, times and classes please visit www.sweetinfinity.com.au.